This excellent account of the British sniper during the First World War was first published in 1920 but has been out of print for some time. At the beginning of the war the Germans utilised snipers to good effect, and Hesketh-Prichard cites figures of one British battalion losing 18 men to snipers in a single day. The British response was ad hoc and organised on a battalion or brigade level. With the Germans in the ascendancy, in 1915 Hesketh-Prichard was appointed ‘sniping expert’ to the Third Army, an appointment based largely on his experience as a big-game hunter and using telescopic sights. He slowly built up the capacity of the British Army to effectively counter the German threat. Scoped rifles were being used but Hesketh-Prichard found in many cases the telescopic sights were not being used correctly, and he embarked on a mission to educate the troops in their use and alignment, alongside training in sniper tactics. Hesketh-Prichard describes the genesis of the sniper, interspersed with many anecdotes of some of the sniper ‘duels’ that took place. Snipers worked in pairs, searching out those foolish enough to stick their head above the parapet of the trench. Their presence could have a huge effect on the morale of the enemy troops, and hence a great deal of time and resources was spent by both sides in trying to hunt them down. This led to an entire industry growing up around sniping, with the Royal Engineers constructing dummy heads, fake trees and animal carcasses, and false periscopes that would be used to draw enemy fire and track the trajectory of a bullet from the resultant entry and exit holes. The book is naturally focused on Hesketh-Prichard’s experiences on the western front, and whilst the resultant account is fascinating, it does not present an all-encompassing account of sniping during the war. There are some fantastic original photographs and illustrations and appendices set out some of the course content of the sniper’s school and a selection of short notes about the role of the sniper and the equipment he used. The role of the sniper in the First World War seems curiously at odds with the way in which death was meted out on an industrial scale. 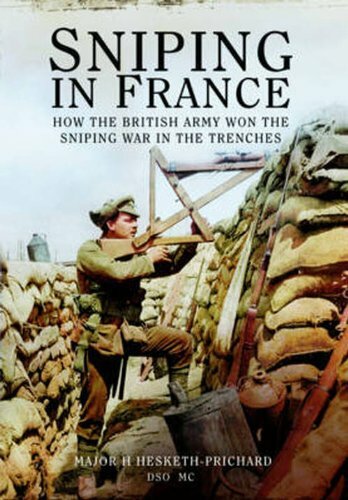 Accounts of sniping in France are few and far between, making this an excellent insight and a timely reprint.